Tell us in detail about the journey of your app. It all started from a phone call Ankit made to co-founder Sahil Jain. Having just returned from a holiday in Delhi, he was sitting at his desk, at a top investment bank in London, staring at the Bloomberg screens and looking at countless charts and graphs. Looking back at his trip, Ankit realised that every time he went out with his friends in Delhi, it was to the same places that he had already been to previously and did not actually visit any new place. Sharing this with Sahil, he figured this was due to a number of reasons, mainly; the lack of information about any new place which might have recently opened, reluctance of my friends to try a different place for the fear of being let down and probably the most important, lack of a unique, independent platform that offers all of this! And thus, began the long and arduous journey of all the four co-founders (Ankit, Sahil, Vivek and Nikhil) at Dineout. What goals did you set when you launched the app? Talk us through the process of achieving them. 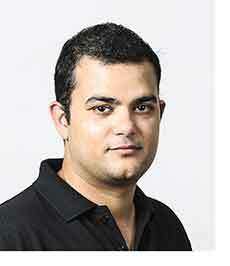 Ankit, along with three other co-founders, founded the app in 2012. They raised a round of angel investment in late 2012 and in April 2014, the app was acquired by Times Internet. In Aug 2015, the app made its product portfolio even more robust by acquiring a Bangalore-based company, inResto and in 2017 we also launched a product, Gourmet Passport, which offers 1+1 on main course, drinks & buffets across 500+ of the best restaurants in Delhi, Mumbai, Bangalore & Hyderabad. It is a must for any true foodie! We pioneered table reservation in India. Starting a table reservation culture had its own challenges. The consumer wasn’t as savvy with the online world as they are now and nobody would look at reserving tables online in India. Restaurants weren’t as tech-savvy as they are now. Also, popular restaurants didn’t sense the need, as they already had many patrons. On the other hand, newer restaurants felt that they wanted to explore the solution only when they became financially strong. However, we strongly felt that the culture of doing things online would soon catch up in India. There already was a dining-out culture, and we were quite certain that before long people would start booking tables online too. Today, a customer books a table in a restaurant, and when he goes there he can order through the app and can even pay through the app. We are piloting with payments on the app with over 4,000 restaurants and 50 per cent of our bookings are transacting through the app. The biggest evolution in the past few years is in the way people are dining out. Restaurants are becoming smarter, and diners are becoming a lot more focussed on getting the right experience. They are more discerning and demanding. We are a strong bridge for great restaurants that want to connect with smart diners. What are the unique features of your app and what makes it different from its competitors? Our USP is that every customer gets a discount. Customers are not only assured of a table booking at a good restaurant, they also get a discount. It can range from 15 per cent to 50 per cent. Moreover, the app also helps the restaurants fill up their off-peak hours by having exclusive offers and additional cashbacks for its customers. We also have a product, Gourmet Passport, which offers 1+1 on main course, drinks & buffets across 500+ of the best restaurants in Delhi, Mumbai, Bangalore & Hyderabad. It is a must for any true foodie. How profitable are apps like yours in a country like India? We can call ourselves number one in driving business to our clients – restaurants. We don’t have to manage a fleet of delivery boys and everything is controlled on the app. Hence there is a lot of transparency in the booking process. Mobile technology will be new norm in the coming months. We have seen a significant increase in our numbers since, we launched our App on iOS and Android. What challenges did you face while setting up the app? The company's ambition from day one was to deliver the best experience possible to the diner. The biggest challenge we saw when we started and see even now is in changing the behaviour of people. We believe it is slowly and steadily getting better. The smarter diners are embracing our service, whether it be over the app, website or the concierge service. The other challenge is in continuously investing in enabling the restaurants to be more agile, consumer-focussed and experiential. What steps did you take to overcome those challenges? Our app solves an important problem in the user lifecycle journey – discovery to destination for a customer looking to eat out. The acquisition of InResto has also added to the offering and now we are able to provide a complete tech stack to the restaurants, which has fuelled the recent growth. InResto provides features like table management, reservations, customer relationship management and analytics, home delivery and takeaway management. The team today claims to have over 4,000 restaurants for table reservations, including chains like Azure, Impressario, Texmex and Speciality. Over 1,000 restaurants use the inResto Restaurant Management Suite. The launch of Dineout Plus was also a milestone for our Premium Dining Section. We also launched Gourmet Passport that offers 1+1 on main course, buffet and drinks. We are working on some cool new features for the restaurants and it promises to be an exciting journey ahead. How many cities does your app currently cover, and what are the restaurants affiliated to it? We are currently established in top 8 metro cities namely: Delhi, Mumbai, Bangalore, Hyderabad, Chennai, Kolkata, Pune and Ahmedabad. We cater to the requirements of mass brands to luxury dining brands. Some of these are Lord of the Drinks, Olive, Social, Chillies, Farzi, Mainland China, SodaBottleOpenerwala, Punjab Grill, Mamagoto, The Irish House, Made in Punjab, JW Marriott, Ritz, Copper Chimney, Pullman, Novotel, The Lalit. We help them through high voltage multimedia marketing campaigns that help them not only get a higher diner count but also provide them massive visibility amongst the top players in the industry. On what technology does your app focus? We are putting a lot of time, effort and resource into reaching out to the vast network of restaurants and consulting them as growth partners. We are drawing data that will enable a business owner to take a more informed decision. This would progress a business through a customer-centric process substantiated by data and insights. The team believes they have a great repeat customer rate, which shows that the diner finds their service beneficial in terms of saving time and money. Brief us about your expansion plans. The journey for us has just begun. We have a long way to go. Our immediate goal is to expand to other cities, introduce new product lines and completely redefine the whole dining out experience. We want to build it into a global brand and see no reason why we should not be able to do that.